Good news for khaki-clad men plagued by speckled staining of their trousers from urine splash back: physicists may have found the optimal splash-suppressing design for a urinal insert, thereby creating a “urine black hole.” Urine gets in, but it can’t get back out. “Since the mid-19th century, both enlisted and fashion-conscious owners of khaki trousers have been plagued by undesired speckle patterns resulting from splash back while urinating.” So begins the abstract for recent work in urine splash dynamics by Tadd Truscott, director of Utah State University’s Splash Lab, and his graduate student, Randy Hurd. Hurd presented their results earlier this week at a meeting of the American Physical Society’s Division of Fluid Dynamics in Boston. If you opt for the classic standing technique, the scientists advised standing as close to the urinal as possible, and trying to direct the stream at a downward angle toward the back of the urinal. That will produce less splash back. But not every man will have good anti-splashback technique, and some just might not care if their pee splashes all over the place. (If you are one of those men — gross.) So Truscott and Hurd turned their attention to urinal inserts as a means of keeping bathrooms clean despite human failings. They hoped to identify the ideal design that would “suppress the splash for you even if you have poor technique.” Or if you’re too damn lazy to care. I had no idea that urinal inserts even existed, never mind all the science that goes into their design. Hurd looked at lots of different designs and found they fell into three broad categories. The first relies on absorbent cloth to keep splashing to a minimum. However, those fabrics can’t absorb liquid quickly enough, and soon become saturated, which just makes the problem worse. “If you see one of these in a bathroom, you had best just move to a stall,” Truscott and Hurd advised Gizmodo via email. A second type of insert adopts a kind of honeycomb structure: a raised layer (held up by little pillars) with holes, so that droplets pass though but splash doesn’t come out. These work okay, according to Hurd and Truscott, but “they are usually not sufficiently high and create pools.” Of urine. Eww. The third design, featuring an array of pillars, seems to work the best, but has the same problem as the second type: the pillars aren’t tall enough to prevent pooling. Truscott and Hurd pondered how to improve on the pillar array design, and found partial inspiration in a certain type of super-absorbent moss (Syntrichia caninervis) that thrives in very dry climates, and thus is very good at collecting and storing as much water as it can. They had just finished a paper about the unique tiny structures on the moss that make it such an efficient water-retainer, able to glean precious drops from mist and fog. It also is sufficiently spongey to absorb water with very little splash. “Its structure allows the droplets to sink deeply in and deforms around the droplet to reduce splashing,” the scientists said. It’s a black hole analog, in other words. So the urinal insert Hurd and Truscott designed employs a similar structure. They simulated urine streams with water droplets and directed them at various sample pillar arrays, varying the pillar height and spacing, among other variables, in order to find the optimal combination for splash suppression. Ultimately, exploring the physics of droplet impact is about much more than reducing urine backsplash; that’s just the most obvious (and colorful) application. 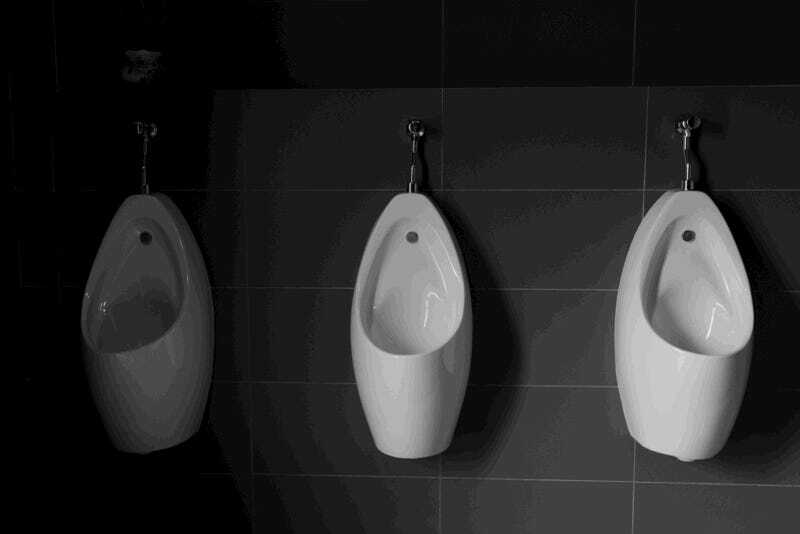 “While we find the connection to urinals interesting, we are confident that the scientific community will have interest in the interaction between the splashing droplet and the pillars, and understanding how pillars can be used to suppress the splashing of impacting droplets,” Truscott and Hurd said. Images: (top) Ekkapop Sittiwantana via Shutterstock. (bottom): Pillar-array urinal insert, via Splash Lab.